After decades of negative media coverage about FIFA's corruption, nepotism and secrecy, its President Gianni Infantinohas hit upon a novel way of looking at the governing body's latest money-driven schemes. Everything's good! Reacting to his own sparrow-brained proposal to expand the 2022 World Cup in Qatar to 48 teams, he gushed last week, “If it happens -- fantastic. If it doesn’t happen -- fantastic also." So the man who's managing to make his disgraced predecessor Sepp Blatter look like a dignified elder statesman may now be known as Gianni Win-Winfantino. Like a converted evangelical knocked on the head by a hooligan's stray flying bottle, the president has decided to see the good in everything and everybody. Except perhaps his critics, from whom he still scampers through the next secure door with an impish smile. That's understandable, because he can't let himself be knocked back by negative vibes (and questions). I fully endorse this approach. There are far too many naysayers in the world. And guess what, they are all journalists. They act as though it was their job to look below FIFA's squeaky clean surface and discover dirt and dodgy deals. If they would only embrace the Win-Winfantino Doctrine, then maybe we could all get along better and just crack on with expanding the World Cup to 128 teams, promoting inclusiveness and uniting the world on the way. And, as he proposed in Miami on Friday, inaugurating a 24-team Club World Cup that would spread the game's wealth even further to ... the major European teams and brands that already pretty much own the game, plus the tiny soccer federations that provide the slavish backbone to Infantino's mandate. Yet more games, yet more cash, what could possibly go wrong? 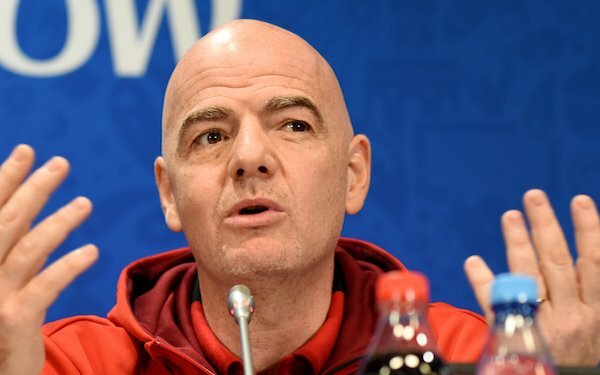 Even some members of the European Club Association (ECA), which last week sent a letter to FIFA strongly objecting to the reformed Club World Cup starting as early as 2021, are beginning to show signs of caving into the Spirit of Infantino. French daily sports newspaper L'Équipe quoted sources at Real Madrid as saying they would be "proud to take part in this splendid initiative." Fantástico! While Bayern Munich president Karl-Heinz Rummenigge told yesterday's Frankfurter Allgemeine Sonntagszeitung, "I understand why FIFA wants to reform the Club World Cup." Fantastisch! So the colossal financial pillars of the European game have started to feel the benefits of Infantino's healing hands upon their bank accounts, despite both clubs being -- as members of the ECA board -- signatories to its protest letter. There's always a gap in the calendar somewhere to fill with more tournaments and more revenue. As long as FIFA's voting system allows for one federation, one vote, some of that money will continue to find a way into the accounts of soccer's governing bodies in such sporting strongholds as the Maldives, Vanuatu and the Cook Islands. Which of course is fantastic. Infantino's positive thinking is already having a vitalizing effect on the game as a whole. Real Salt Lake coach Mike Petke said after his side's 5-0 defeat at D.C. United on Saturday, "Hey, I got to see a Wayne Rooney hat trick and a lovely strike from Lucas Rodriguez. Fantastic!" Chelsea coach Maurizio Sarri said after losing 2-0 to Everton this past weekend, "There aren't many teams who come to Goodison Park and fail to come away with any points -- a defeat here is a real collector's item. Fantastic!" There may be those who quibble that seeing everything in a good light is infantile, like handing out medals to all participants, even the losers who failed to score a goal or win a game. That what works at the U-9 level may not be best practice for the adult world. That as long as we allow crooks, liars and secretive charlatans to hold office unopposed, elected thanks to colleagues hamstrung by self-interest, then the game is heading for yet more trouble. That as long as critics are ignored and internal reports suppressed, then we will only pay lip service to transparency and accountability. Gianni Infantino will run as the sole candidate for FIFA President in Paris on June 5. For him, it's a win-win situation. There is apparently no one else fit to even compete. Fantastic. 1 comment about "Fantastic FIFA and its Win-Win President". beautiful game, March 20, 2019 at 6:17 p.m.
Infantino is all about money, and when everything is all about money hubris escalates and a cesspool develops... just like it did with FIFA's previous con artist. The "spirit" of Infantino et al is a black hole for the global game.